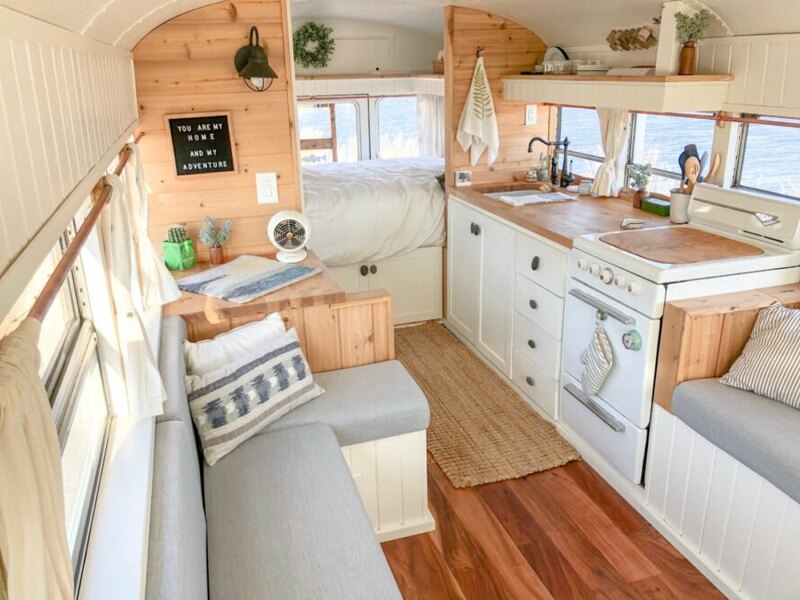 Remodeling an old bus into a new tiny home on wheels is never an easy feat, but most times, the results are breathtaking. Such is the case with Mande and Ben Tucker’s renovation of a 1992 school bus. 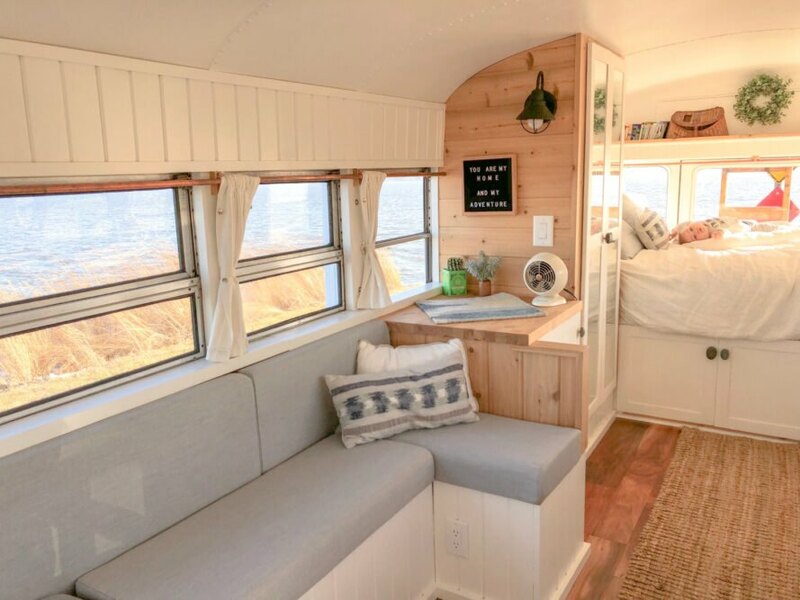 Renamed Fern the Bus (in honor of the main character in Charlotte’s Web), the couple renovated the 24-foot-long skoolie themselves, creating a customized, light-filled adventure-mobile. 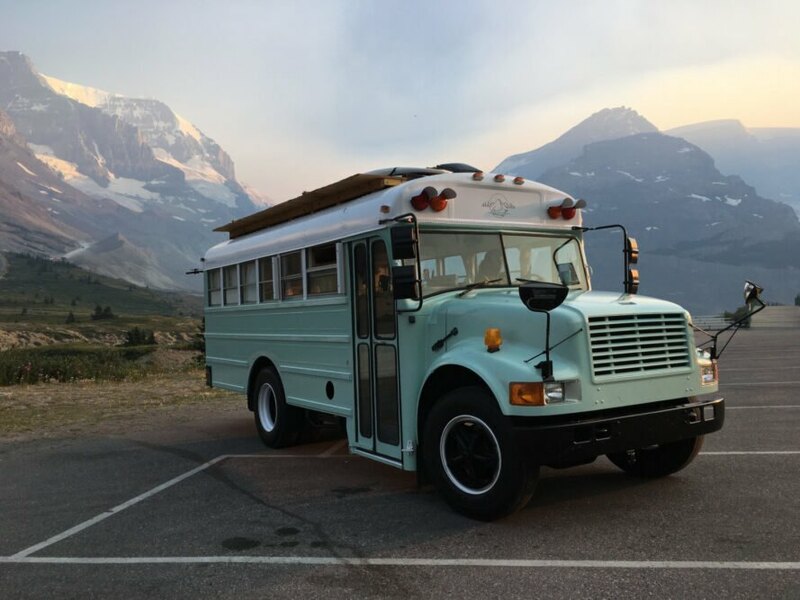 According to the couple, the 1992 International School Bus was in great condition when they purchased it, making the DIY renovation project in front of them just a little bit easier. Their first step was to strip the exterior of all of its original elements and repaint it in a fun sea foam green. 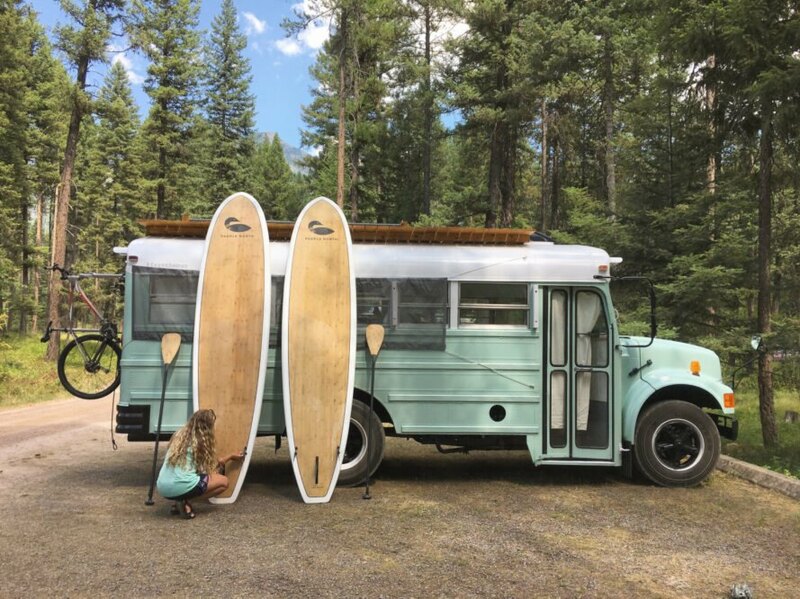 The bus is just 24 feet long and 7 feet wide, which meant the couple needed to custom design and build most of the furniture. After gutting the interior seats, rubber mat flooring and the bulky heating and AC units, they got to work crafting their future living space. Mande and Ben worked on the bus conversion for about a year. The result is a beautiful tiny home, well-lit with ample natural light. Throughout the living space, the couple used both natural cedar panels and white-painted pine on the walls, giving the interior a modern cabin feel. Acacia wood floors run the length of the home. The living room is marked by two large built-in sofas with cushions that Mande hand-sewed and stuffed with the foam from the old seats. At the end of the bus is the sleeping space, which fits a full XL mattress. In between the living room and the bedroom is a compact kitchen that houses all of the basics: an under-the-counter refrigerator, an oven with a stovetop and butcher block countertops with live-edge lumber accents. Plenty of shelving and storage keeps the interior spaces clutter-free. Next to the kitchen, a mirrored closet conceals a marine portable toilet. As for the family’s energy and water needs, a 25-gallon water tank of freshwater supplies water for the faucet and outdoor shower. The bus is also equipped with a 25-gallon gray water system. A propane tank provides heat for the oven and stove as well as the tankless water heater. Another great feature of Fern the Bus is her outdoor space. The couple outfitted her rooftop with a wonderful cedar deck, which is used for hauling sporting equipment, such as paddleboards. Additionally, the space is used as an open-air lounge, with enough space to have elevated picnics or do some stargazing. 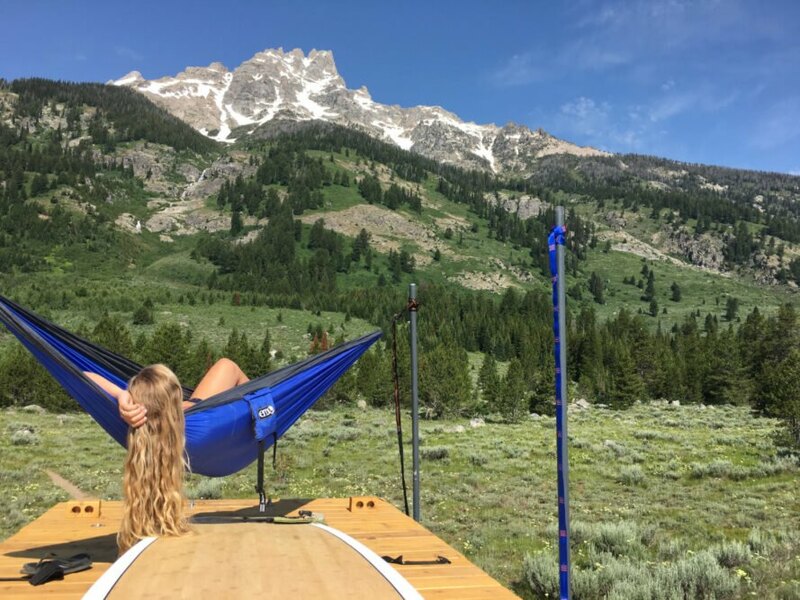 As an extra bonus, four posts are perfect to hang the couple’s hammocks, making it a prime spot for nap time. 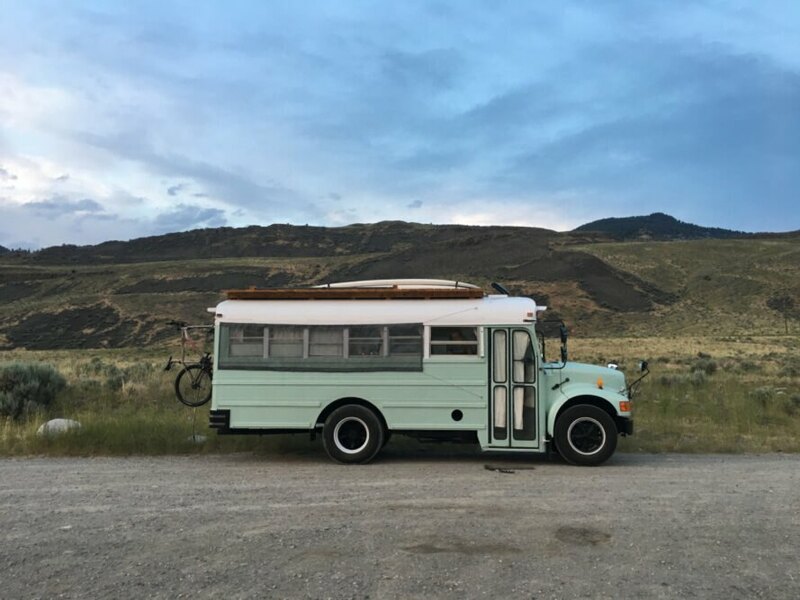 Mande and Ben Tucker turned a 1992 International School Bus into a beautiful tiny home on wheels. The exterior of the bus was painted a calming sea-foam green. The rooftop terrace holds the couple's sporting equipment. The family drives the bus all over the U.S. The interior space is bright and welcoming thanks to an abundance of natural light. They named the bus Fern, in honor of a main character in Charlotte’s Web. The bus is 24 feet long and 7 feet wide. Strategic, space-saving techniques keep the living space uncluttered. The rooftop terrace has four posts for hanging a hammock. 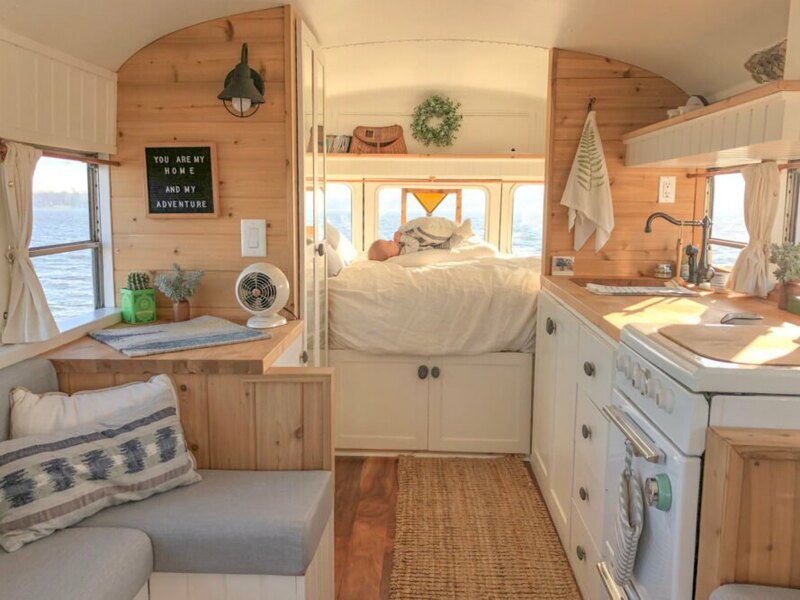 The tiny home on wheels has been given a new lease on life as an adventure-mobile.